A song inspired by Charles Dickens’ famous book A Christmas Carol has been recorded in a bid to become a classic festive hit. The song, A Christmas Carol, named after the classic Christmas tale, has a powerful message of goodwill to all. It was commissioned and sponsored by Cause UK, a specialist agency working in the beyond profit sector, for the Malton Dickensian Festival. The recording features two choirs and the UK’s number 1 Gospel singer, Philippa Hanna. MD of Cause UK and Festival director, Clair Challenor-Chadwick, said: “Our festive song celebrates all that is good about the Christmas spirit of generosity, as penned by Charles Dickens in A Christmas Carol. The song also launches an annual Christmas Carol writing competition. 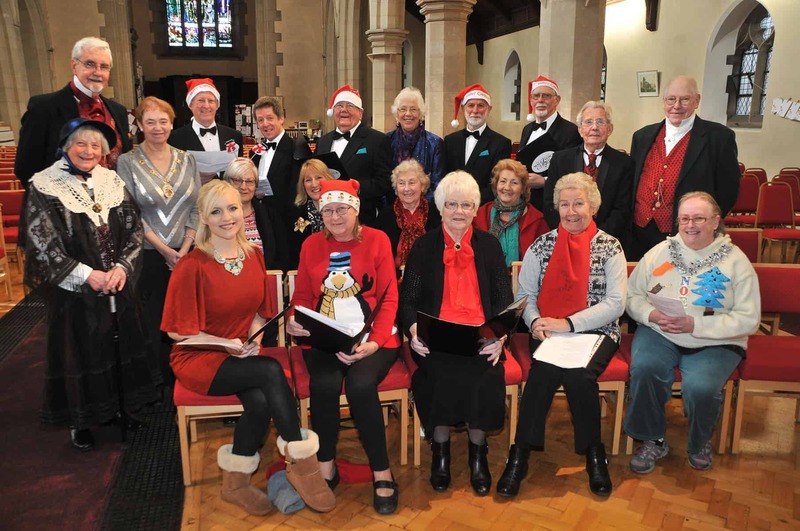 Top UK Gospel singer Philippa Hanna, front left, with members of Malton Male Voice Choir and the town’s Harmonia Choir at St Peters Church on Saturday for the recording and filming of a song inspired by Charles Dickens’ classic tale A Christmas Carol. Picture David Harrison. Malton Male Voice Choir and Harmonia Choir braved a chilly winter’s morning to take part in the music video recording at St Peter’ Church, Norton, Malton. There were also solo performances by David Ackroyd of the Malton Male Voice Choir and Rafe Chadwick, 10, from Harrogate. Members of the Charles Dickens Malton Society dressed in Dickensian costume and Joan Lawrence, Mayor of Malton attended the recording to show her support. Philippa performed the song with the choirs in the church then filmed a music video in the market town. The song will be performed live at the festival on December 18 by the Malton Male Voice Choir and the town’s Harmonia Choir. In 2013, Clair Challenor Chadwick led the campaign, which raised funds to buy and ‘bring home’ a rare signed copy of A Christmas Carol, which Dickens sent to a friend’s widow in the town. Clair went on to found the Malton Dickensian Festival to build on this Dickensian legacy. A Christmas Carol will be available on ITUNES on Monday 30th November. Funds generated will contribute to the running costs of the Malton Dickensian Festival, which is a charitable arts and education project.